From the mums who have tried, tested and got the t-shirt, to healthcare professionals and wonderful weaning experts. With them we shed light on top tips and tricks of the trade, expectations and how to make it that much easier for you and baby. 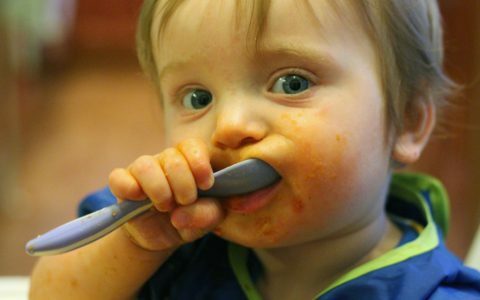 As with most matters of parenting, whether you choose baby-led weaning or spoon-fed weaning – neither method is proven better than the other. New parents should explore both and find a combination that feels right for you and baby. Both methods will support their development in different ways. Introducing your baby to soft chunks of steamed veg, cooked meat, potato etc (baby-led weaning) will encourage the strength and coordination of their lips, tongue and jaw which long-term will aid speech development and word formation. 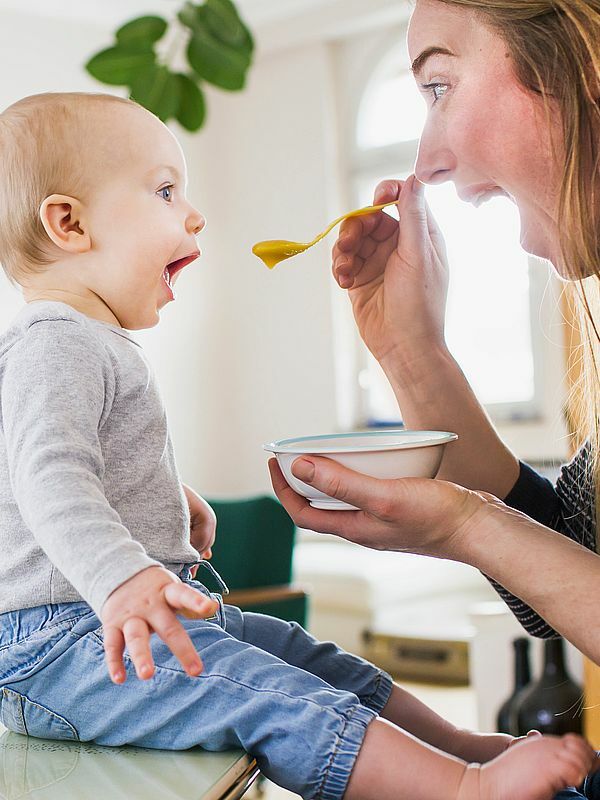 Smoother foods, purees and liquid meals (spoon-fed weaning) are naturally easier to digest early on which will enable baby to take on more nutrients, quicker. With the cooking juice collector of the Nutribaby+, nutrients lost through steaming ingredients for baby purees can be added back in at the blending stage! When selecting fruit, veg and other more solid foods, give them foods that naturally have an easy handle for them to hold onto – for example, broccoli florets, corn on the cob and half a banana. Alternatively cut veggies into sticks before softening them in the steamer. This will help them to pick up foods easily while they are developing the ‘pincer’ action. 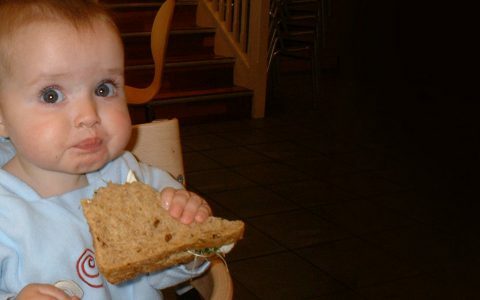 Whether they decide to launch it at you or love it, it’s worth remembering that your baby will taste something up to ten times before they truly decide if they like it or not. Keep giving them variety each day, try not to repeat and go back to things they show disinterest in; they will usually change their mind! Utilise your freezer and prepare meals easily in advance. With the Nutribaby+ you can batch cook a whole week’s worth of baby meals/purees thanks to its extra-large capacity. 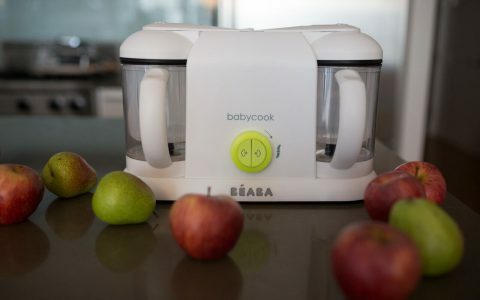 In the early weaning stages, freeze tiny portions in large ice cube trays and for older babies small tupperware containers like babybols™ are perfect. Simply defrost and warm individual portions as and when you need them. This can be done easily and accurately with the Nutribaby+ timed steam-warming function. Two J’s to avoid – despite the softer texture of jelly, it is actually more prone to getting stuck on the way down. Fruit juices often contain high concentrations of sugar which definitely should be avoided particularly for young babies. When time doesn’t allow, don’t bother cooking/preparing an entirely different array of foods for baby. Whizz up your leftovers or whatever you have prepared for yourself and the family. As well as less work for you, this is cost-effective, a great opportunity for them to get used to new food combinations and means the whole family can sit down and eat together! 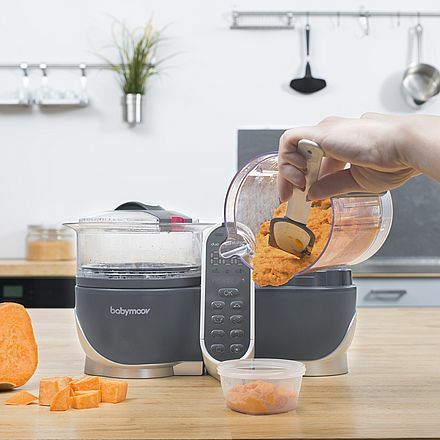 With the Nutribaby+ you can prepare a whole family meal while blending up a portion for baby with its dual blender and steamer function. What’s key in the weaning stages is variation of texture, shape and taste. Try not to impose any personal food dis-tastes or worries onto them, if you can. Fearlessness to try everything from an early age will encourage a less-fussy eater long-term and perhaps a more adventurous character! FOUNDED IN 1997, BABYMOOV'S MISSION IS REINVENTING THE EVERYDAY LIFE OF PARENTS BY PROVIDING EXPERTLY-DESIGNED, RELIABLE AND TECHNOLOGICALLY-ADVANCED PRODUCTS APPROVED AND CO-CREATED WITH PARENTS AND PROFESSIONALS. OUR UNIQUE, INNOVATION PROCESS PLACES USAGE AT THE CORE OF PRODUCT DEVELOPMENT. ALL OF OUR PRODUCTS ARE CREATED WITH PARENTS TO ENSURE WE DESIGN A PRODUCT THAT ANSWERS TO THEIR NEEDS AND MAKES EVERYDAY LIFE, EASIER!